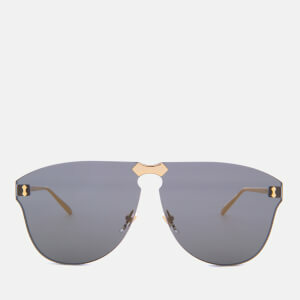 Gucci sunglasses with angular acetate frames. Crafted from ivory acetate with a chunky, rectangular frame, the glasses are inset with grey lenses and accentuated with gold interlocking 'G' detailing at the temples. Presented in a velvet case with branded pouch and lens cloth. Eye Width: 61mm. Bridge Width: 17mm. Temple Length: 130mm.